Home / Blog / Beauty / Botox Equals Weight Loss? Recent studies have shown that Botox® is more than a wrinkle-filler that also aids sufferers of migraines, hyperhydrosis, and chronic pain. Now it seems it can help those struggling with weight loss. 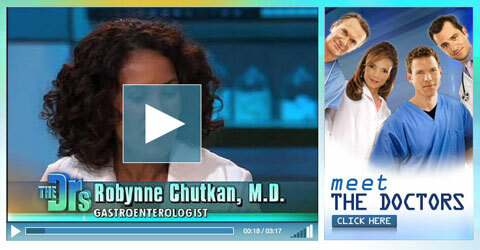 Watch the Meet the Doctors segment with Dr. Robynn Chutkan. A new (and ongoing) study suggests that botulinum toxin products such as Botox® can be injected into the walls of the stomach to suppress appetite. Patients are sedated at the time of procedure, as doctors use an endoscope to view the stomach’s interiors before injecting the Botox. The botulinum toxin “temporarily relaxes the muscles of the stomach so that it can’t contract as vigorously, and you feel full faster and you eat less food,” explains Gastroenterologist Dr. Robynne Chutkan, founder of the Digestive Center for Women (Chevy Chase, Maryland), on a recent episode of The Doctors. Clinical trials showed that the food stays in the stomach longer, delaying emptying time and cutting the maximum tolerated volume, or the amount of food and liquid it takes a person to feel full, in half. “The peak effect takes about two to three weeks, just like botulinum toxin in the skin where it takes a few weeks to kick in, it’s the same thing in the stomach,” Chutkan says. Only ten patients thus far have been treated, says Chutkan, who shared with viewers a video of the procedure being performed on her own stomach. “It’s subtle, but you definitely feel full faster,” she says, noting that she lost seven pounds in three weeks. What do you think of this procedure? Risky or worth it?